WHEN January 18th 2018, 6.30 p.m.
WHY An array of notable keynote speakers will be invited throughout the year to start a conversation on various food related topics to the public, followed by engaged conversation. The idea is to make these conversations that touch upon the daily lives of everyone open to the community. The Institute for the Future (IFTF) is an independent, nonprofit research group with almost 50 years of forecasting experience located in Palo Alto, California. The core of their work is identifying emerging trends and discontinuities that will transform global society and the global marketplace. They provide insights into business strategy, design process, innovation, and social dilemmas. Their research generates the foresight needed to create insights that lead to action. Their research spans a broad territory of deeply transformative trends, from health and health care to technology, the workplace, and human identity. IFTF created Seeds of Disruption: How Technology is Remaking the Future of Food, a forecast map and set of perspectives and Artifacts from the Future, to tell the story of how emerging information technology will reshape every step of the food system. 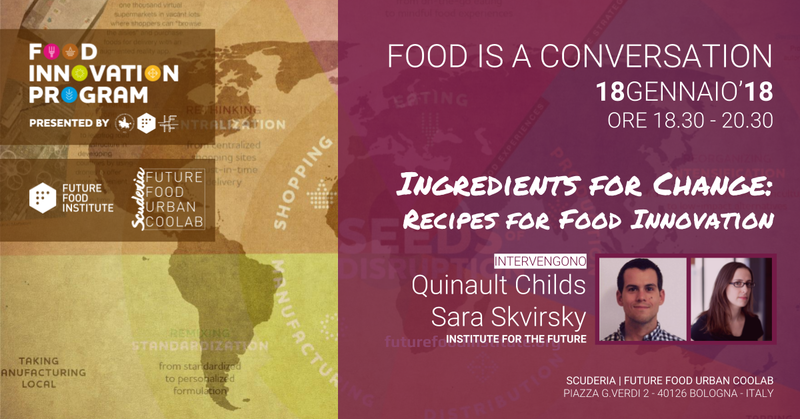 Quinault Childs is a research manager in IFTF’s Food Futures Lab. He comes from a background in food and agriculture entrepreneurship, which most recently includes co-founding a company that uses insects to upcycle food waste into animal feed. He is fascinated by applying systems thinking to explore the interconnected nature of food and society, using storytelling as education, and encouraging everyone to become more adventurous eaters. Sara Skvirsky is Research Director at IFTF. She brings a diverse background in the fields of education, community organizing, and social justice advocacy to her work as a researcher for the Ten-Year Forecast program. Having spent several years in Latin America and Spain before joining IFTF in 2011, she approaches futures thinking from a deeply global perspective. In addition to being a member of the Ten-Year Forecast team, Sara leads much of IFTF’s future of learning research, working with governments, educational institutions, corporations, foundations, and non-profits around the world to understand the rapidly shifting landscapes of education and work.